8 June 2015: There are eight of us from CSNTM in Athens right now. We’ve begun the process of digitizing New Testament manuscripts at the National Library of Greece this summer. CSNTM has a contract with the NLG to digitize all their NT manuscripts—over 300 manuscripts altogether! The director of the NLG, Dr. Philippos Tsimpoglou, is a visionary with energy, drive, innovation, and desire to bring the NLG into much greater prominence in the international discussions about ancient texts. CSNTM is very grateful to Dr. Tsimpoglou for this key partnership in digitally preserving and making accessible 150,000 pages of biblical manuscripts. I have spent more time in Athens than in America this year, preparing manuscripts for the photographing teams. In the process of documenting each manuscript, I have come across some exciting discoveries—many of which were already known to the library, but not all. The Institut für neutestamentliche Textforschung in Münster, Germany is the official cataloguer of Greek NT MSS. And until INTF has catalogued a manuscript, it is generally not known to New Testament scholars. To date, we have found at least ten manuscripts that are not yet catalogued by INTF. 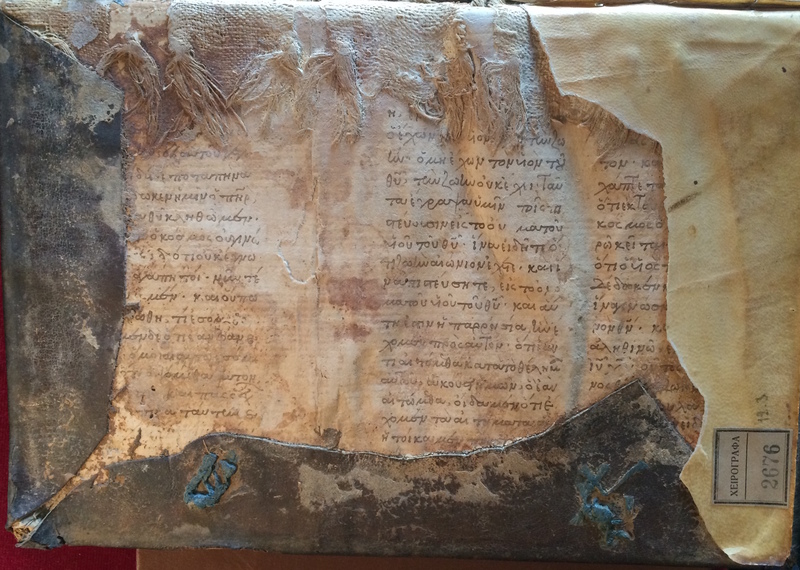 In this blog, I want to discuss an apostolos (Acts and Catholic Epistles) manuscript that is glued to the inside front and back covers of a lectionary. NLG 2676—known to biblical scholars as Lectionary 1813—is a 12th century Gospel lectionary, written on beautiful vellum, with 240 leaves still extant. It has ornate headpieces for each of the Gospels, produced by a true craftsman. 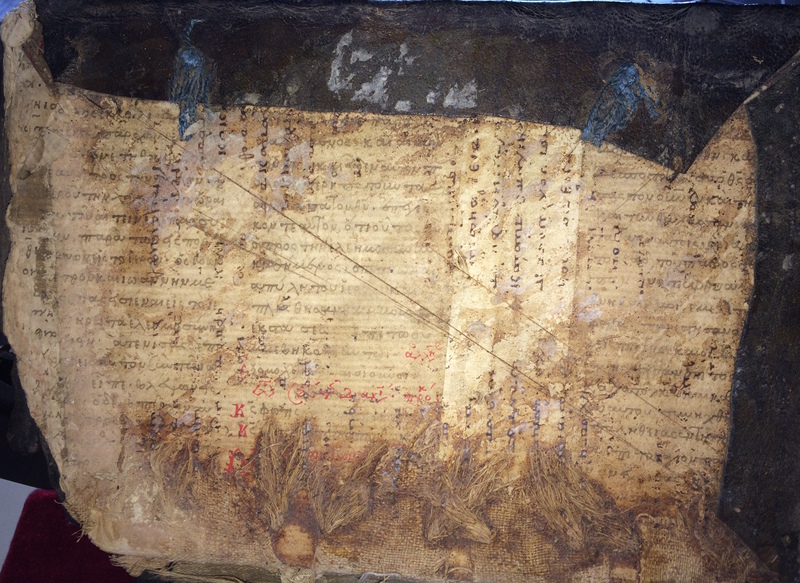 Glued to the inside of the front cover is a manuscript leaf of a decidedly different character. Written in a professional but rather utilitarian hand is a two-column paper leaf. A leaf from the same manuscript is glued to the back inside cover. This paper manuscript is written in a later hand, 13th or perhaps 14th century. On the front inside cover three columns are visible. There is a vertical crease after the first column, which is our first clue that what is extant is a bifolio (or double leaf). The left column begins with 1 John 2.29 and ends at 1 John 3.3a. The next two columns are from the same page; the text is 1 John 5.11b–15 in the first column and 1 John 5.18b–21 in the second. The left column of this page gives us the full lines so that we have firm evidence of how much text would be written on each line (they average 19.5 letters). The gap between 1 John 3.3 and 1 John 5.11 tells us that the bifolio is not the middle double-leaf of the quire, but is the bifolio prior to the midpoint. This is due to the fact that (1) there are approximately 30–31 lines per column (only 17 of which are extant), (2) there are approximately 600 letters per column, with two columns per page (and four per leaf), and (3) 1 John 3.3b–5.11a would involve approximately 250 lines or 8 columns. Thus, the gap would involve two columns per page, four per leaf, eight per bifolio. Therefore, this is the bifolio just before the midpoint of the quire. Although this MS follows the Byzantine text, it has a rare variant of the aorist subjunctive πιστευσητε (049 218 945 1751 2374) instead of the present subjunctive πιστευητε in v. 13. It also has what may be a unique variant in v. 15, ητοικαμεν instead of ητηκαμεν. In the era in which this manuscript was written, the pronunciation of οι and η would have been identical. But the spelling alteration is most likely due to the scribe’s faulty memory as he repeated to himself the word he saw in his exemplar before writing it down. The paper glued to the inside of the back cover is also a two-column bifolio, with the first two columns on the left side, followed by a vertical reinforcement strip, with text (which would have been used to strengthen the joint between the two leaves), then one column on the right. This bifolio is in worse condition, with the residue of ink from another leaf, along with the intrusive reinforcement strip, covering a large section of the text. Further, the original script has been written on top of in certain places, making the task of positive identification a bit tricky at times. The text begins at Acts 3.1; χω]λος εκ κοιλιας (Acts 3.2) is visible on the what appears to be the third or fourth line in the far left column. This goes through Acts 3.5a (ο δε επειχεν αυ–). The second column picks up at v. 8 (the second line reads αλλομενος και αινων) and continues through v. 10. After this, it gets confusing. The next line appears to begin with a rubricated and enlarged epsilon. That would normally indicate a new section of material, whether it be the next paragraph in Acts, a new lection (if this is a lectionary), or perhaps the beginning of a commentary section. The word looks like εξομολογ…, so we should expect it to say something about confession. The string of letters doesn’t seem to match anything in the NT, nor is it the beginning of a lection. Further, the letters look as though they are written on top of others—yet there’s a mismatch between the under-text and upper-text. The whole thing is a puzzle. I invite any readers who may have access to better tools than I do while away from my library to offer their solutions to this conundrum. It’s probably an easy solution that is simply escaping me at the moment. There are 57 known apostolos minuscules from the thirteenth or fourteenth centuries that have both 1 John and Acts in them. Tentatively, this manuscript is the 58th, but we will most likely need to resolve what comes after Acts 3.10 on the backside to make that a definite assertion. Nevertheless, it’s always a thrill to find another manuscript of the New Testament. It is not uncommon to see manuscripts carved up and used as binding leaves in other codices. Obviously, it is unfortunate that a manuscript would be cannibalized, but many such manuscripts have been partially preserved by gluing them to wood-and-leather covers. Without such treatment, they might not have been preserved at all! The following tools are helpful for those who are fascinated by Greek New Testament manuscripts but are not sure how even to begin studying them—either online or in the flesh. This is a very basic bibliography (we didn’t want to overwhelm you right from the beginning). This is not a bibliography for New Testament textual criticism per se; rather, it is intended to be a primer on examining the manuscripts. Aland, Kurt, et al., eds. Kurzgefasste Liste der griechischen Handschriften des Neuen Testaments, 2nd ed. Volume 1 of the Arbeiten zur neutestamentlichen Textforschung (ANTF). Berlin: Walter de Gruyter, 1994. Since 1963, the K-Liste has been the standard tool for comprehensive knowledge about Greek New Testament manuscripts. It lists every extant manuscript with content, date, dimensions, columns, material, leaves, and location. It also has a convenient section of conversions between Tischendorf’s and Gregory’s systems, and Gregory’s and von Soden’s. In the back of the book is a list of all the sites that have Greek NT manuscripts, listed by city and library, along with the shelf number. For those who wish to see actual manuscripts, this is the indispensable bible on Bibles. It has been and continues to be updated as an online version, which has many useful search features. Cavallo, Guglielmo, and Herwig Maehler. Greek Bookhands of the Early Byzantine Period: AD 300–800. London: Institute of Classical Studies, 1987. The standard resource on the professional scribal writing of manuscripts in the early Byzantine period. Cavallo, Guglielmo, and Herwig Maehler. Hellenistic Bookhands. Berlin: Walter de Gruyter, 2008. The standard resource on the professional scribal writing of papyrus manuscripts in the Hellenistic period. Elliott, J. K. A Bibliography of Greek New Testament Manuscripts, 3rd ed. Leiden: Brill, 2015. This is the standard first-stop for a comprehensive treatment of what has been written on the various Greek NT manuscripts known to exist. Written by a meticulous scholar, who leaves no stone unturned, Professor Elliott’s Bibliography is must reading for going deeper with each manuscript. Perhaps what is most surprising in the volume is how many manuscripts don’t even have a paragraph written on them yet—about 80%! But if there’s a publication, dissertation, or obscure journal article about a given manuscript, Elliott includes it. That so many have nothing on them indicates that there is much, much more work to be done. Gardthausen, V. Griechische Palaeographie, 2nd ed. Leipzig, 1913. Another classic that has stood the test of time. Hatch, W. H. P. The Principal Uncial Manuscripts of the New Testament. Chicago: University of Chicago Press, 1939. Another classical text that set the standard for dating Greek majuscule manuscripts of the New Testament. Lake, Kirsopp and Silva. Dated Greek Minuscule Manuscripts to the Year 1200. 10 volumes(!). Boston: 1934–1939; Index (Boston, 1945). For getting the scripts of dated manuscripts up to the beginning of the thirteenth century, there is nothing that compares to Lake and Lake’s 10-volume set. It’s also extremely difficult to come by. If you can find it, let me know—I’ll buy it! Metzger, Bruce M. Manuscripts of the Greek Bible: An Introduction to Palaeography. Oxford: OUP, 1981. This is the best primer on getting into Greek biblical manuscripts (both New Testament and Old Testament). It’s a classic text, with several plates and characteristically Metzgerian detailed discussions. Help is also found in dating manuscripts and collating them. Parker, David C. An Introduction to New Testament Manuscripts and Their Texts. Cambridge: CUP, 2008. A breathtaking array of secondary literature and primary insights on NT manuscript study from Great Britain’s leading active NT textual critic. Roberts, C. H., and T. C. Skeat. The Birth of the Codex. Oxford, 1983. The standard introduction to when and why the codex book-form came into existence and later become the standard book-form in late antiquity and the middle ages. Thompson, E. M. An Introduction to Greek and Latin Palaeography. Oxford, 1912. A standard introduction which, though dated, still has much useful material. Turner, E. G. The Typology of the Early Codex. Philadelphia, 1977. Eric Turner was one of the great scholars of paleography, papyrology, and codicology. His opinion is always sober and never to be treated lightly. Turner, E. G. Greek Manuscripts of the Ancient World. Oxford: Clarendon, 1971. The long-time standard against which all other works on ancient book-making have been measured. van Groningen, B. Short Manual of Greek Palaeography, 4th ed. Leipzig, 1967. And a third classic that is quite useful for dating manuscripts. These ought to be enough to get any bibliophile started down a path of rich discovery and illumination. Several other important volumes could have been listed as well. These are intended for those whose interests are not just in the texts of the biblical manuscripts but in all aspects of those manuscripts. So awesome, thanks Dr. Wallace! What a privilege it must be to do what you and your team are with at the moment!. Thank you for all the hard work to the benefit of all Christianity! May God bless you richly! We appreciate your work and especially when you share snippets of your experience like this one with us! I’m curious. We Bible readers in the United States principly use translations (NIV/NET/ESV) based on the Alexandrian/eclectic texts. What about the rest of the world? How about in China? Africa? South America? I’d like to answer your question concerning South Africa. For the English we use mainly the same translations, basically the King James and the NIV. But our Afrikaans Christians received their first Afrikaans Bible in 1933, based on the Textus Receptus, and in 1983 a new translation based on the NA Text. Since then we had 4 independent translations and the Bible Society is busy with a new translation using the UBS text. Of the 11 official languages 10 have complete bibles, some translated around 1880, but all have the New Testament. The SA Bible Society is constantly upgrading the translations available in the local languages. My own interest is in the causes for the differences between Bible translations. I just published a book looking at 100+ differences in the Afrikaans Bibles, and hope to publish mostly the same material concerning the KJV and the NIV early next year, in America.Most of the material is available on my blog. For our first “blast from the past” post today we take a look at the latest project of NT Greek scholar Daniel Wallace (Dallas Seminary), who is in Athens with a team digitizing ancient Greek manuscripts. There are plenty of images of these precious documents, so take the time to browse a while – even if you don’t know Greek. You will at least learn to appreciate how God preserved His Word (NT) in its original language. Obviously the Lord continues to be the One who opens doors that no man can close. We at CCU are very grateful for what you and your team are doing. Your work in Athens will be a major contribution to the New Testament scholars around the globe and your teachings in the iTunes videos will be extremely helpful as our students begin their new Master’s Program this September. You may want to take a short break and jog around the track at the Olympic Arena. Keep the research coming our way. Kyle’s above observation that the folio also contains Ac 4:24-27 is important. Obviously this is a part of a lectionary reading containing Ac 4:23-31. Now Ac 3:1-11 (or 3:1-8) and Ac 4:23-31 are both normal readings of the full Greek Praxapostolos. But in all Praxapostolos I have examined up to now, Ac 4:23-31 never follows Ac 3:1-10 immediately. The akoloutheia is as follows: Ac 3:1-10, 3:11-16, 5:12-20, 3:19-26, 4:1-10, 4:13-22 and then only comes 4:23-31. This could suggest, I think, that this folio of l1813 was copied from a mutilated Praxapostolos archetype, in which folios had been lost. Such a mutilation could also account for Ac 3-1:10 followig a reading of I John, a fact I have not met yet in other lectionaries. Dr. Wallace, is there an equivalent of J.K. Eliot’s “Bibliography” for manuscripts of the Old Latin and Vulgate? Thank you for the work you and CSNTM are doing! They let you take a picture of ancient text? Doesn’t that compromise the paper and ink?? Well, if we put bright lights and kept them on for several minutes, yes, it would compromise the ink. The ink, however, is already compromised from centuries of deterioration. Our task is to digitally preserve these manuscripts before they go away for ever. Further, digitizing them also indirectly preserves them in another way: visitors to libraries can now examine the images instead of handling the manuscripts.